Karl Marx once called this ruling class a ‘band of hostile brothers.’ They stand against each other in the competitve struggle for the continued accumulation of their capital, but they stand together as a family supporting their interests in perpetuating the profit system as whole. Protecting this system can require the cover of a ‘legitimate’ force – and this is the role that is played by the state. An understanding of this system can not be gleaned from looking at the inter-personal relations of this class alone, but rather how they stand in relation to other classes in society. Hopefully They Rule will raise larger questions about the structure of our society and in whose benefit it is run. We do not claim that this data is 100% accurate at all times. Corporate directors have a habit of dying, quitting boards, joining new ones and most frustratingly passing on their names to their children who not entirely coincidently are also found to be members of US corporate boards. There is no single easily parsed single authoritative public record containing these shifting datasets. Luckily there is LittleSis.org a community of obsessive data miners who specialize in “profiling the powers that be.” Little Sis has very generously made their data available to They Rule through their API. If you see something that is incorrect you can contribute to both projects by signing up at Little Sis and editing the data there. That correction should become immediately available on They Rule, however, it will not be instantly updated in the auto-mode or in saved maps. This site was made by Josh On with the indispensable assistance of LittleSis.org. Special thanks to Matthew Skomarovsky of Little Sis who really went out of his way to help make the data from Little Sis work with They Rule. The latest version of They Rule would not have happened were it not for a fellowship from Renew Media (now Media Artists). Thanks to Amy Balkin of Public Smog for her help and encouragement. Thanks to Amy Franceschini and Futurefarmers for their support. Thanks to the Mission branch of the International Socialist Organization for putting up with my complete spaciness as I was consumed in the production. Thanks to Media Temple for their great and generous hosting. The first version of They Rule was a static set of data gathered from the websites of the top 100 companies. 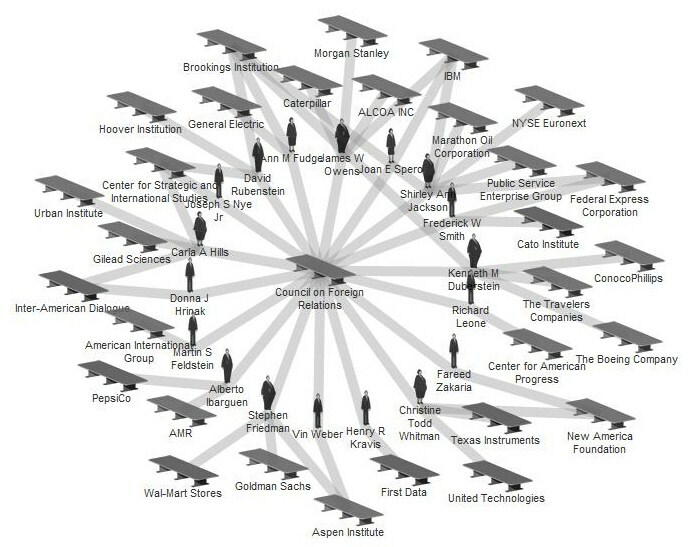 They Rule was updated to include the top 500 US companies, and added the ability to find the connections between any two of these companies. They Rule was connected to LittleSis.org and provided users with the ability of users to interface with the top 1000 US companies. It also added the auto-mode which automatically browsed through the interlocking directories with out user intervention.